Jason Gerling has always loved rhythm. "My mom jokes about being at parades and as the drums wentby, she would feel me thumping in her belly. She kind of joked, 'I wonder if I'll have a drummer some day?'" In third grade, Jason got his first real drum set. He then followed the natural progression from novice drummer to semi-professional, rising up the ranks in band programs, competitions, and extracurricular bands he formed with his friends. Minneapolis is the birthplace of many musical successes, including Prince, Semisonic, and Bob Dylan. 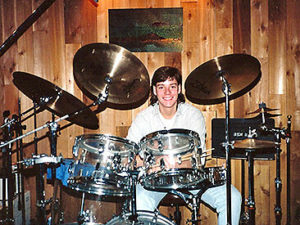 Along with subbing for other notable drummers in the music community, Jason was the drummer for several bands, including Clear Confusion, E B Da, and, lastly, Shane and the Wild Weasels. March 26 was a Saturday and the night of the Weasels' gig at the North Star Bar. It was a great venue, Jason said, and he was eager to play. The night went perfectly. Everyone was sweaty and exhausted, which is really where the story begins. "(After the show) the band kind of encouraged me to stay in town, because they were all staying that night at a hotel. I actually wanted to get back home because I was planning on going to church with my sister in the morning. So I left, and I started to get tired...I remember that." The clock was crawling toward 3 a.m., and after a high-intensity show and just enough beer to make him tired (though he was far below the legal limit), Jason's body began to feel heavy and his eyes began to droop. He recognized the danger of driving when tired and worked outa plan to be able to finish the trip. He'd stop quickly and drink some coffee at the Treasure Island Casino and maybe play a round of blackjack to wake himself up before finishing his ride home. That was the last thought Jason remembers having. Deputy Luther Klug was patrolling the back roads in Hastings, MN. This particular one was dark and empty, with the exception of one car in the middle of the road. It was immediately evident that the car had been rolled. This had happenedwhen Jasonhad fallenasleep; he had driven across the road to the shoulder and then woken up just enough to try to correct his error. Investigators would later say his car rolled five to seven times before it came to a stop in the road. There were drum cases and glass shards strewn randomly across the asphalt like some sort of morbid confetti. 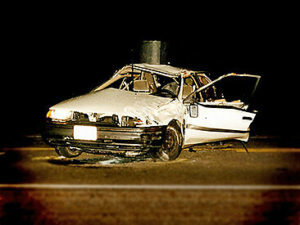 Klug, a drummer himself, quickly released his seat belt and ran over to the vehicle. There, he found a young man buckled into the driver's seat with blood running down his face and neck. Jason's head laceration was so gruesome that Klug would later say it looked as though he had tumbled out of his life and into a horror movie. Luther could see there was no way of gettingJason out ofthe vehicle. Noticing that Jason was struggling to breathe, hequickly pulled an oxygenmask from his police car and pressed it to Jason's face. 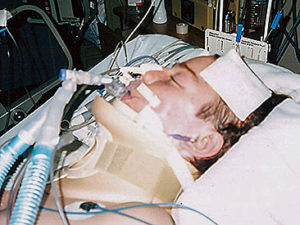 Jason drifted in and out of consciousness at Regions Hospital in St. Paul. When his mother showed up, she saw her son lying shirtless in a hospital bed, with a dotted line across his chest. The medical examinations revealedthat Jason had a decompressed skull fracture, a collapsed lung, and a spinal contusion between his C6 and C7 vertebrae. The dotted line was a line of paralysis. "At this time, that dotted line shows where he is affected," the doctor explained to a shocked Mrs. Gerling. She was overcome with emotion and grabbed her son's hand, kissing it and crying on it. She wanted to tell him something, but she wasn't even sure he'd hear it. Still, she tried. "Jason," she said. "We are here for you. You were in a bad car accident. We love you." At this point, Jason couldn't talk because of the breathing tube in his mouth, but he opened his eyes and managed a half-smile to communicate thathe'd heard her before drifting back into sleep. The head injury had caused severe short-term memory loss. Because of this, every time Jason regained consciousness, he would panic and motion to his legs. He had to have the realities of his paralysis explained and to relive the experience over and over again. His recovery wasn't easy. He stayed for two months, nearly lost his life once, and had to come to terms with the knowledge that, as a 23 year old, he was now partially paralyzed. Between March 27 and May 18, Jason didn't havea lot of time alone to think about his new circumstances. It wasn't until he returnedto his parents' house for a home visit that his new reality really sank in. As he was wheeled up to his parents' front door, he remembered clearly walkingthrough it on two legs to put the last of his equipment into the car before driving to his gig two months prior. Now, he'd never pass through that door, so familiar to him, in that way again. In the entryway, he was hit with the smell of freshly baked bread, a smell he'd thought about in the hospital as he imagined returning home. In his dark-blue bedroom that night, the enormity of life from now on lay heavy on his chest, right at the level of the dotted line. "I lost it. Tears were streaming down my face and I was like, 'Oh no. I'm never going to play drums again. I don't know how I'm going to do this,'" he said. "Everyone always knew me as 'Happy Jason.' I was always pranking and joking. And I didn't want anyone to see a negative side to me so I kept it very quiet." He was given over to the care of a psychiatrist. He remembers her saying, "Jason, you are going to experience a lot of hardship with this. And I want to encourage you, Jason, to talk about it." "And I told her, 'I'm fine,'" barely being able to squeeze such a hugelie through his teeth. The depression continued and got deeper; so did the counselling. Sometimes he'd imagine how he'd end his life and get out of the dark spot he was in. The solution to happiness, the psychiatrist said, was not to bottle up the emotion. Rather, Jason was instructed to tell his friends and his family how he felt and to accept it. Eventually, he continued outpatient therapy at the Courage Kenny Rehabilitation Institute, and it was here that he was first approached about speaking events. Jason wasn't sure at first. What could he possibly say? He was a depressed, paralyzed kid whose dreams of traveling the world seemed to be over. Still, after encouragement from his therapist, he began to talk at disability awareness events. From there, Regions Hospital invited him to speaking events held forthe emergency responders and local high schools. Then he began speaking at churches. Jason recommitted his life to Christ and leaned heavily on his faith to help him through these trying times. With every recitation of his favorite verse (Philippians 4:13 "For I can do everything through Christ, who gives me strength,") a part of his soul was healed. And with every event he spoke at, a piece of himself returned. It was during one of these events that Jason saw his now-wife, Bobbi. She was sitting in a church audience as Jason retold his story. It wasn't love at first sight, because it wasn't first sight at all: at school, Bobbi's best friend, Genie, was Jason's best female friend. Genieused to joke about Bobbi and Jason eventually dating, but, at the time, they were both involved with other people. Still, Jason couldn't help but scroll a note on the back of one of his high school pictures: "If you ever break up with your boyfriend, let me know," complete with a drawn-on smiley face. So when Jason saw Bobbi, it was really like finding a friend again. He'd been dumped recently by his first girlfriend after the accident because her family hadn't approved. He'd lost friends that he thought would be there for life. But in Bobbi, he'd finally found a friend, and eventually, a partner for life. They were married in 1997. Things were going well with counseling for Jason. Being able to have serious conversations with kids in church youth groups and in schools gave him a release. Then, his therapist suggested Jason may want to consider going back to school. "She said, 'Your drumming career might be over. You need to be realistic about this.' And I said, 'I don't want it to be over.' So I had two big choices on my mind: college or drumming." To Jason, drumming was still a very painful subject even to think about. Looking at the sheen off the kit's cymbals under the overhead light in his parents' basement was nearly impossible without thinking of the ruined set strewnacross the dark road stained with his blood. Regretfully, he says, he sold his set to pay for college classes, and would have sold a second set he had built by hand if his father hadn't persuaded him otherwise. For his father, the pain he saw in his son's eyes was hard to bear, but deep down he knew Jason would getback to his drumming. Jason completed an associate degree in electronic publishing and pre-press in 1999. He then entered the corporate world. But before long, Jason wentback to his drums. At 23, Minneapolis native Jason Gerling was an aspiring drummer with a promising future. Drumming professionally since he was 16, studying under acclaimed drummer Gordy Knudtson, writing profound music and performing in top Minneapolis clubs since 1986, success seemed no more than a beat away. 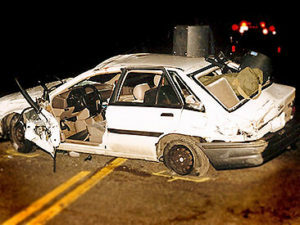 In 1994, while driving home from a late night performance, Jason fell asleep at the wheel of his car. The resulting crash left him with a decompressed skull fracture, concussion, punctured lung, and a C6/C7 incomplete spinal cord injury. 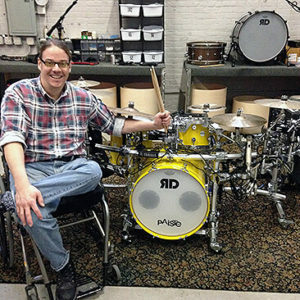 By 2004, Jason, now a quadriplegic, was not only drumming again professionally, he also realized that his unique position enabled him to inspire and encourage others. Jason anxiously started a music production business where a unique drumming opportunity emerged. 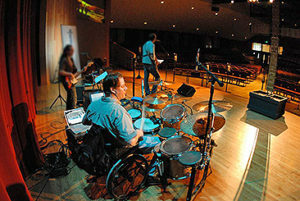 Over the next several years, Jason invented an entirely new way of playing drums from his wheelchair that does not require him to use his feet. Learn more about Jason by visiting his site athttp://www.wheelchairdrummer.com.